Just a short post to show you the cake I’ve made in honour of my mum who would be celebrating her birthday today. I’ve made it in her loaf tin. Mum was not so bothered about presents but I knew exactly how she felt when I once forgot a card, she was not impressed to say the least. I think I was about 19, I never missed another birthday again, no matter where in the world I was. My sister and her daughter will be up later to share the cake, it’s raspberry, banana and white chocolate. 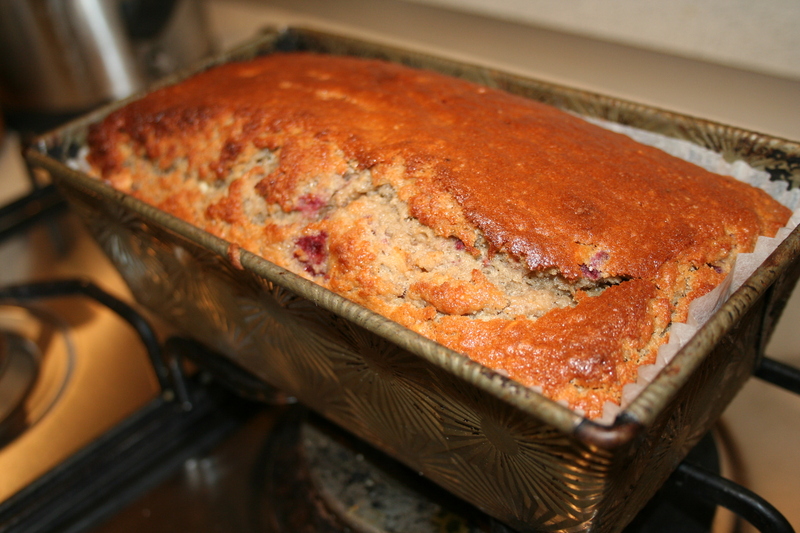 I have adapted it from the banana bread on The View from the Table blog. I hope this link works. This is a brilliant recipe, the first time I tasted it it was the curlywurly version. Amazing. I added a handful of frozen rasps, one banana and half a bag of white choc chips (well what was left after H checked they were ok). Better go and stop the cake being eaten before my sister has arrived. never been on a blog before !! Blog virgin! !